Ask yourself if you’ve giving your child permission to tell the truth. Remember that children most often lie to avoid punishment. What does your child think you’ll do if he tells you what really happened? Even though, as adults, we can’t be forced to testify against ourselves in a court of law, we routinely ask our children to do just that. 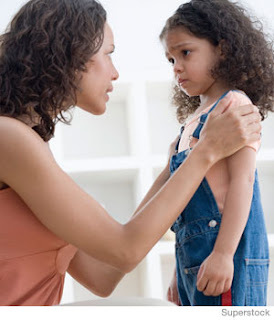 Children often tell psychologists and teachers that they felt guilty and wanted to tell their parents what they had done, but they saw that their parents were in a bad mood when they came home, and worried about the punishment they might receive if they didn’t lie. One way to encourage your children to tell you the truth is to focus your responses on their specific behaviors (breaking that heirloom vase) rather than on their characters (“You never listen to me when I tell you not to play ball in the house!”). Give them a chance to make appropriate amends when they’ve done something wrong so that they don’t feel that they’ll be punished forever if they tell you the truth. Look for patterns in lying as clues to what’s really going on. These patterns can be in the situations where children lie, as well as the content of those lies. For example, you should be more concerned if your child routinely lies in several settings, such as in school or with friends, as well as at home. A child who has problems with self-esteem is more likely to lie in a variety of situations, but a child who’s afraid of punishment will lie mostly to the people he’s afraid of. Remember that lying is an act that involves at least two people, not just your child. If you want your child to stop lying to you, you’ll have to change as well. Ask yourself if your own patterns of lying have given your child the message that it’s all right for him to lie. Have the restrictions you’ve placed on your children’s activities changed as they’re gotten older? For example, a child in late elementary school will want more control over how he spends his weekly allowance than younger children do. Let’s say that you don’t want him to “waste his money” on comic books. If you later ask him how he got the Spider Man comic that’s in his room, he’ll probably lie. The most realistic solution to the problem is to let him buy the comics. This is an important way of recognizing that he’s growing up. Besides, buying comics is pretty innocuous and is probably even beneficial; it’s a much better choice than spending his allowance on cigarettes, alcohol, or illegal drugs — substances that are increasingly used by school-age children. Besides, kids are less likely to ask to do really outrageous things if you’ve allowed them to do at least a few semi-outrageous things. Don’t tempt your child to lie. If you know your child forgot to feed the dog, don’t ask him if he did so. If your child begins by lying to you, don’t let him continue and dig himself in deeper. Instead, stop him and let him know that you know he’s lying. Remember that it’s better to assume the role of an educator than the role of a police officer. Help your child learn how to accomplish what he wants without lying to do so. Show him how he might tell you the truth. (While this may be obvious to you, it may not be to him.) Explain that telling you what really happened offers him a chance to correct the situation at least partway. If all children learn is that they’ll be punished when you catch them lying, they’ll simply become better liars.